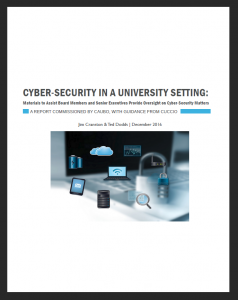 Cyber-security has become an increasingly important issue in all sectors, including academia. Although our member institutions have been aware of and dealing with cyber-security incidents and issues for a number of years, the threats are becoming much more sophisticated, the risks and impact have increased and the academic community has become a target for today’s innovative, and dangerous, cyber criminals. Questions relating to the overall cyber threat landscape, the assessment of risk and the mitigation strategies required have triggered discussions on our campuses at the very senior levels, including the Board and Senior Executives. As a rapidly evolving issue, addressing cyber-security concerns will require constant oversight, adaptive processes and ongoing discussions at all levels. We hope you find the material useful and that it will provide a solid foundation for the ongoing and constantly evolving discussion of cyber-security within and amongst our member institutions. The authors of this report, Ted Dodds and Jim Cranston, are former University CIOs and experience consultants who conducted the research and provided recommendations contained herein. You can download the complete report, the executive summary, and the powerpoint presentation template on our Surveys and Report webpage. Previous Previous post: 2017 CAUBO Recognition Awards – Deadline Approaching! Next Next post: Congratulations Brent Davis and Tiffany Steinke-Roblin!